When I signed up to bring in treats for my daughters' preschool class for their Pumpkin Patch Day, I was determined to NOT bring in something full of sugar. Then, I started actually thinking about what to bring and I was stumped. Cupcakes and cookies were everywhere and seemed to be the logical choice. I also wanted to stick with the pumpkin theme of the day and several kids have food allergies, which made things a bit more challenging. When I saw the giant boxes of fruit cups at Sam's Club, I knew they would work for my pumpkin theme. Cups of mandarin oranges plus a black permanent marker made for an easy pumpkin treat that was a lot healthier than a sugar filled dessert snack. I just freehanded a cute little smiley pumpkin face on the side. I suppose you could also cut out some vinyl with your Silhouette and stick on the side of the cup. Peaches would also work for an orangey pumpkin. 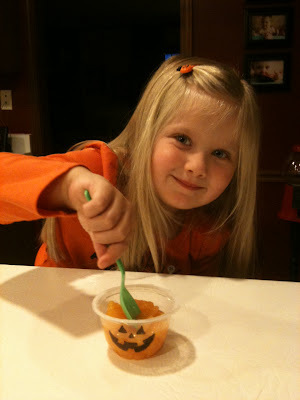 I added a green spoon and a pumpkin napkin and the kids seemed happy with their snack. They didn't seem to miss the sugar and the other moms were appreciative. What a brilliant idea! It is such a challenge to take fun snacks that are also healthy, but I sure appreciate it when people take the extra time to do something healthy!! These are great. My little Kindergartener has snack day on the 31st and we have to bring in prepackaged items. I was trying to think of what I could send in bc I didn't want to bring in something like cookies, etc. THANKS FOR THE IDEA!! !